On Sunday 6th July 2014 at the 2014 20th Anniversary Seminar of the Quilt Study Group of Australia in Sydney, Gail Chalker will give a talk titled 'Greenmount Cemetery - an Early Inspiration for Baltimore Album Quilts'. In 1982 Gail first came across two things which changed her life. The first was the famous American quilting magazine ‘Quilters Newsletter’. And the second, within that same magazine, was a photograph of a Baltimore Album Quilt and an article about it. This chance encounter was the beginning of a life of appliqué for her. Now, over 30 years later, Gail still has a keen passion for all styles of hand appliqué - in particular Baltimore Album quilts and recreating/reproducing old quilts. Currently Gail is working on a series of Mourning Quilts from Victorian times that were made in England and America. The epitome of this series will be her tribute to the Greenmount Cemetery in Baltimore, Maryland, USA. A goodly portion of the original Baltimore Album Quilt (BAQ) makers are buried in Greenmount Cemetery. When Gail first spoke to us last year about this work, she said – “In September 2012, I visited the Greenmount Cemetery in Baltimore, Maryland to view the headstones where most of the motifs used in Baltimore Album Quilts were taken from, and where a good percentage of BAQ makers were buried. This cemetery was a planned business venture in 1838, as opposed to burials being in church yards. After much discussion with the Board of Directors I have been given permission to make a quilt featuring the layout plan and headstones. As well, I have been researching both the stone carvers etc. families of the time period and why their motifs became so popular with BAQ makers. The quilt will be large around 96 x 96”. I don’t know what I am enjoying the most - the research or the construction of the huge site plan which I am doing in English paper piecing". 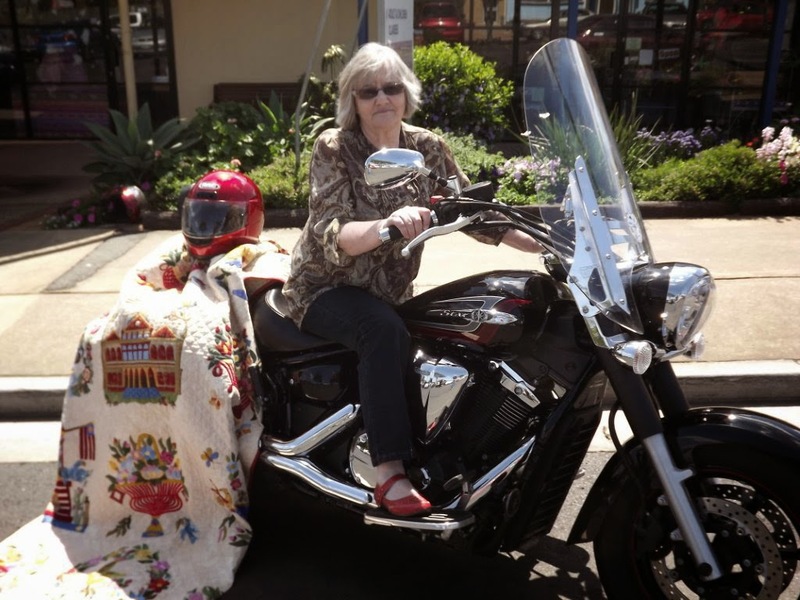 But what else could you expect from this unconventional quilter who not only loves motorbikes but is also a mortician and owns a successful quilt shop in the Lockyer Valley township of Gatton in Queensland?